On the night of Feb. 1, the Grand Hall at Indiana University’s Neal-Marshall Black Culture Center was abuzz with energy. Inside the dimly lit hall, performers dressed in historical costumes calmed their nerves and gathered near the stage at the center of the room. Outside, a crowd of over 250 students made their way through a buffet line of soul food and browsed art made by Black student artists. In a few moments, the two groups would meet in a celebration that made clear the foundational impact of Black communities on centuries of American music. The event was A Night at the Juke Joint, an event presented by the Neal-Marshall Black Culture Center and supported by the Office of the Vice President for Diversity, Equity, and Multicultural Affairs. In a night that spanned both decades and musical genres, the event allowed members of the community to enjoy student musical performances and experience the lively atmosphere of a juke joint. Such juke joints were popular with Black communities throughout the 19th and 20th centuries, giving individuals a place to come together and celebrate in the Jim Crow-era South. Throughout the years, these juke joints helped establish Black communities as profoundly influential on music genres ranging from country and blues to jazz, soul, gospel, and hip-hop. In all, over 250 members of the community gathered in the Grand Hall to participate in the juke joint. According to Monica Johnson, director of the Neal-Marshall Black Culture Center, the event shattered attendance records, with standing room only throughout the night. For Johnson, the high level of attendance indicated that interest in the history of Black music and culture will only continue to grow. “To be able to be a Southerner living in the Midwest and share those things, not only at the institution I work for, but with the students I support directly, was a really good feeling, a rejuvenation for me as a Black professional,” Johnson said. 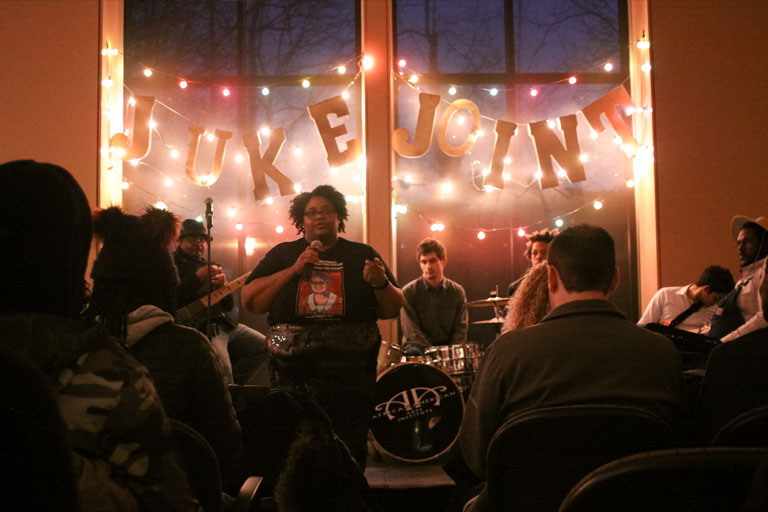 The Night at the Juke Joint was only the first event marking the 2019 Black History Month on IU’s Bloomington campus. With a theme of “Lift Every Voice: A Celebration of Black Music and Art,” celebrations throughout the month will recognize the transformative power of Black voices in music, culture, literature, and art. These celebrations take on special importance at IU Bloomington, which hosts the African American Arts Institute, the only institute dedicated to African and African American performing arts traditions on a U.S. college campus. Founded by Herman Hudson, the African American Arts Institute houses three different groups on the IU Bloomington campus: the African American Dance Company, the African American Choral Ensemble, and IU Soul Revue. Many of the performances throughout the juke joint showcased the talents of students who perform in the three groups. “Fifty years ago, Herman Hudson had the vision to think of how we could use what is unique in the Black community to bring people together, and to continuously celebrate what is so special: our music, our dance, and the fact that we have a way of coming together in fellowship to build a sense of community,” said James C. Wimbush, vice president of Diversity, Equity, and Multicultural Affairs, Dean of The University Graduate School, and Johnson Chair for Diversity and Leadership. Maria Hamilton Abegunde, a visiting lecture with the African American and African Diaspora Studies program and the founding director of the Graduate Mentoring Center, attended the juke joint to celebrate the beginning of Black History Month and recognize the student talent that came to the forefront throughout the night. “One of the beautiful things the center does is give students the opportunity to be showcased, because we may not see these students because of their majors or where they are, but this is an opportunity to actually see the work that gets done,” Abegunde said. Peyton Womock, a senior studying informatics, music, and cognitive music from Bloomington, IN, was one of those students. As a member of the juke joint band, Womock played saxophone for performances ranging from renditions of blues to hip-hop and R&B. He also had a chance to perform a gospel rendition of Kanye West’s “I Wonder” for the crowd. For Womock, celebrating the month through music was a key way to broaden the conversation around Black culture during Black History Month. “Music helps spread messages very well,” Womock said. Indiana University’s celebration of Black History Month continues throughout February. Read more about the events taking place here.